Solar screens are by far one of the best window treatments for your home. They are great because they allow you to keep your view and also block out the sun and the heat. These types of solar blinds are great for commercial applications as well. One of it's large benefits is that most solar coverings are fire retardant. This is great because a lot of hotels, hospitals and other locations need to have fire retardant blinds so that fire does not spread easily. This allow with a lot more features is why solar treatments are quickly becoming the best type of blinds for your home or business. You can read through all of the reviews for solar blinds here on our site. As you will read, you will see why they have the best coverings for window tinting. They can also be used for many applications like patio doors, french doors,bedrooms,offices and commercial retail stores. However, if you require privacy at night then these window blinds might not be great for you. The reason is that sun curtains are opening and you can see through at night time if you have the light on inside your home. 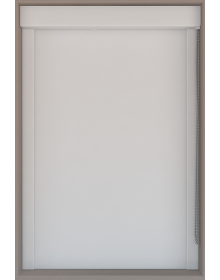 These solar screens are made from top quality fabric usually used by big brand name companies like Phifer, Bali, Hunter Douglas, Graber and others. If you need a custom color just let us know and we will try to source it for you. Are These Solar Window Blinds Better Than Those In Lowes, Home Depot, Walmart and other department store? Our sun blocking treatments are made with the best high quality so we are confident you will love them and they do come with a lifetime warranty! We are the actual manufacturers so you don't need to worry about a third party and you can order direct! Do These Window Screens Provide Blackout? No, solar roller coverings are light filtering and are open because they are transparent. They come in different opennings and openness factors like 1%,3%,5%,10% & 16%. These are the percentages of how open they are. The more open the mesh the more light will come through the window and the less privacy you will have.They also come in many different colors so you can get the perfect one for your home. Each screen material will have different costs and ratings.Go to each page for the specifications. They are truly the best sun blocking window treatments and prevent the sun's glare from coming inside your home and allowing you to watch your tv without the glare! Can These Be Used For Outdoor & Exterior Use? Our solar screen fabric material is very durable and can be used outside, however, the mechanisms are not made for outdoor use. We are working on provide more cost effective solutions soon. These sun drapes are usually for indoor use. These roller curtains are very enegery efficient and provide high insulation to your home. Installation will be very easy and simple. They just need to be installed with two brackets and then snapped on. Furthermore, they can be made cordless with a spring loaded mechanism. These are great for child safety and require no cords or cables. They can also be wireless and motorized. These drapes would be remote controlled and electric. 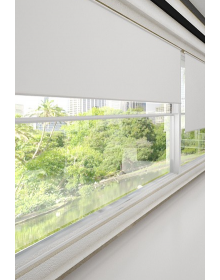 We also have options for battery operated motorized solar blinds so no wiring is required. We are also working on getting top down bottom up for them as well. Can You Make These Window Treatments For Large Windows? Yes! We can make these window coverings for extra wide windows and oversized applications. 10 x 8 is a normal size when it comes to solar treatments. If you would like, we can also make them in 2 on 1 headrails. If you need help ordering, just give us a call. 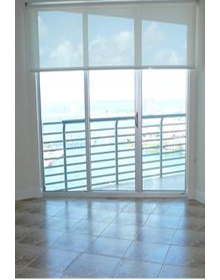 All in all, these window treatments provide excellent uv ray protection and have many upgrades available like fascias, valances, side channels and can be upgraded from chain clutch to stainless steel chains and other things.